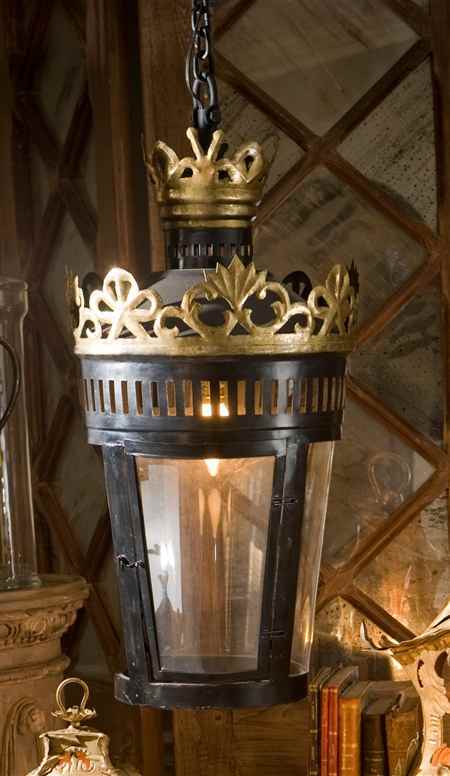 Lighting falls into the category of house jewelry. It says so much about a house and its owner. Nothing is worse than outdated light fixtures. It is what I will notice first when walking into a home. And nothing is a quicker update than changing out lighting. Let's look at some new trends that are in the marketplace. 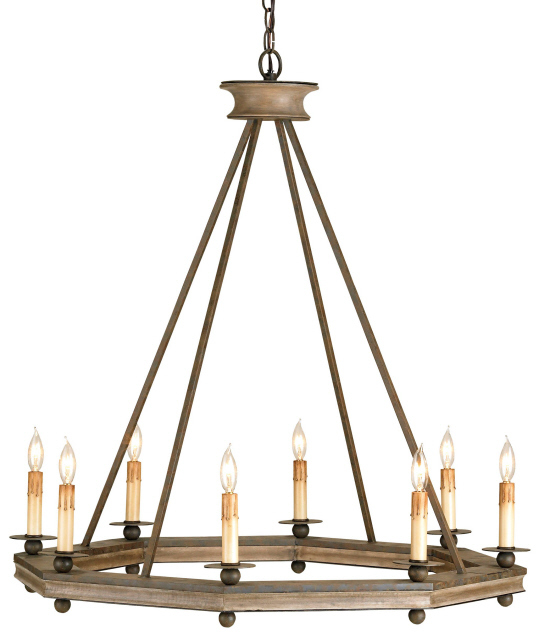 The chandelier above is from Currey and Co. and is a lovely mix of traditional styling interpreted in a modern, more natural way. I love the shape and the natural, aged finish. This look could work with so many styles of decorating, from rustic farmhouse, french country, swedish luxe, to updated traditional. Just love. Here we see again the natural, aged finish and the pared-down elegance of another Currey design. 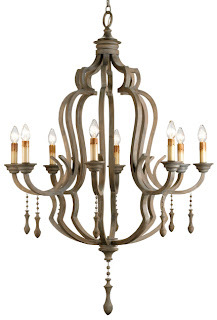 This is reminiscent to me of the grand chandeliers hanging in chateaus and grand homes like Biltmore House. Simple yet so elegant. 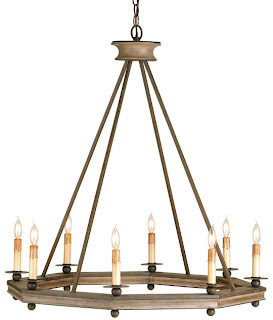 Lantern style chandeliers are a hot trend right now and it is one of which I am a big fan. It's just a classic look and there are so many great interpretations of the design out there currently. This particular one is from Vagabond Vintage. 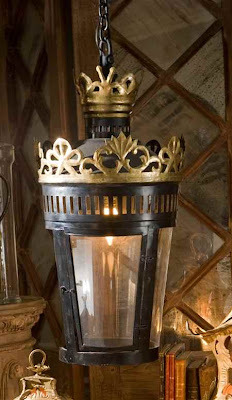 I see it being equally at home in a dressed-up setting as well as putting some bling into a more casual or rustic decor. 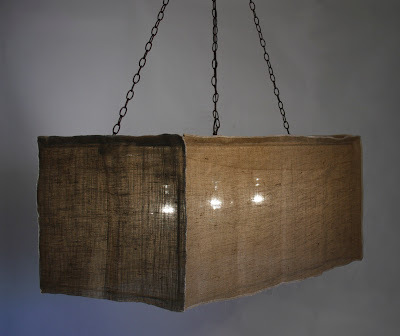 How's this for rough-luxe elegance? This burlap chandelier from Zentique is the epitome of pared-down, artsy style. I can visualize this paired with dressy Louis chairs with modern fabrics and a farmhouse table. Tara Shaw always brings it. Style that is. This fresh interpretation of Empire style is clean, airy, but elegant. 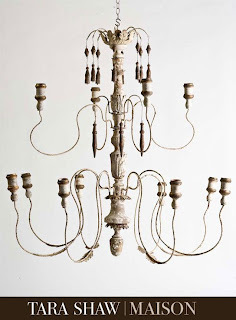 This type of chandelier will always be among my favorites. Another Tara Shaw beauty is shown here. An aged-finish wood lantern chandelier which to me is so Italian looking. I think maybe this is my favorite du jour! Currey again here with a nod to the lantern style. This feels elegant and simple at the same time. It could work in so many different styles of decor as well. 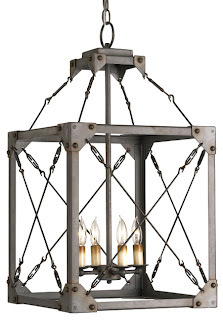 This dressy lantern/pendant style fixture from Currey in a distressed pewter finish is one of my favorites. I used one recently in a clients office. 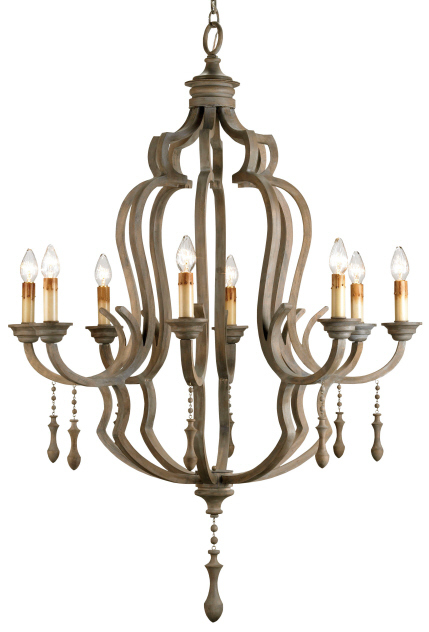 Choosing the right chandelier is the first task, followed by knowing how to hang it when you get it home. 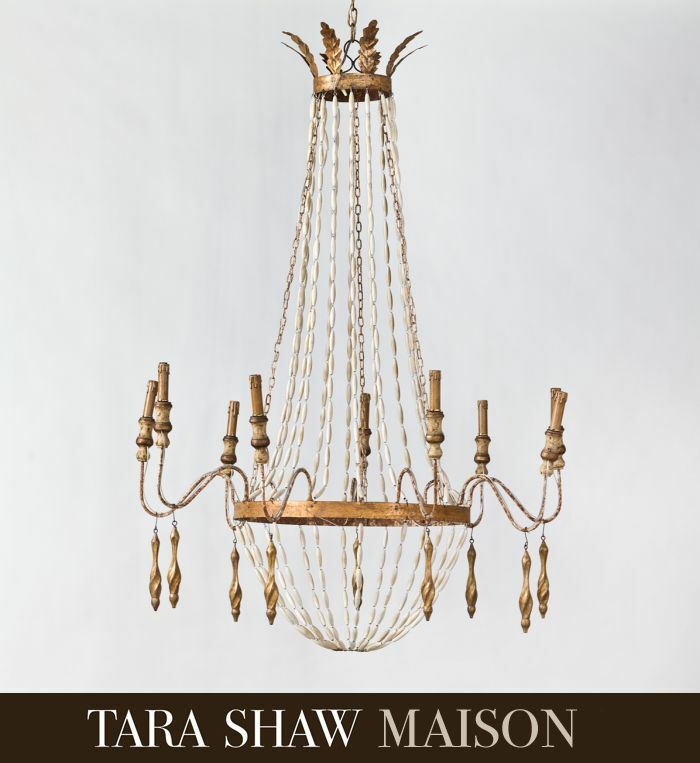 It is suggested by many lighting companies and designers that a chandelier be hung anywhere from 30-34 inches above a dining table in a room with 8 foot ceilings. If your ceiling is higher than that, the fixture should be hung 3 inches higher for each foot of ceiling. Truthfully, I often just eyeball where I think the chandelier looks best. 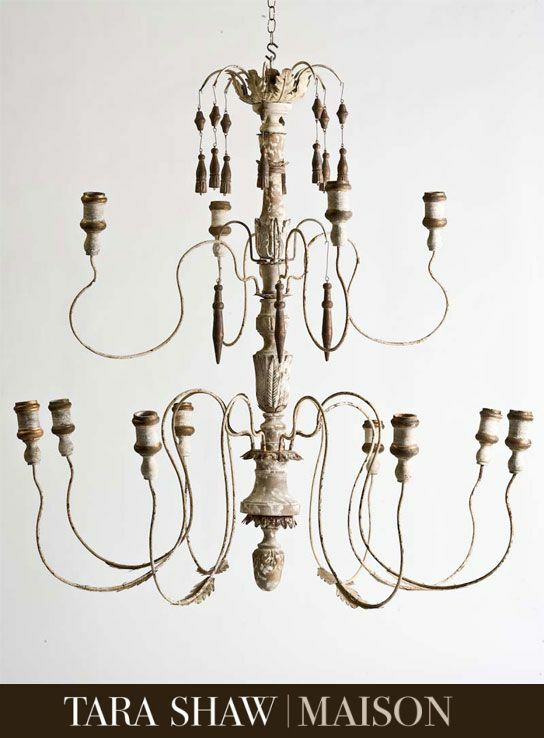 As far as size and scale goes, it is suggested that the chandelier be 12 inches narrower than the table over which it hangs. I realize these chain covers were in vogue for a while, but it is time for them to go away now. This is too fussy and just calls even more attention to the chain and away from a beautiful chandelier. Can you imagine this thing on one of the Tara Shaw beauties above? Sacrilege! Another issue is cleaning and care. If your chandelier has crystals or glass, it needs to be kept dust and smudge-free in order to shine to its full beauty. 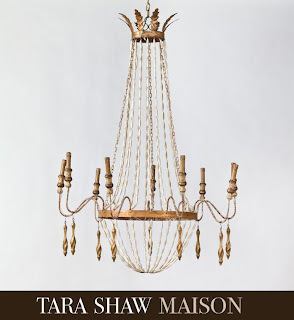 I will leave you with one more gorgeous Tara Shaw chandelier. This look is popular now and is one of my favorites. 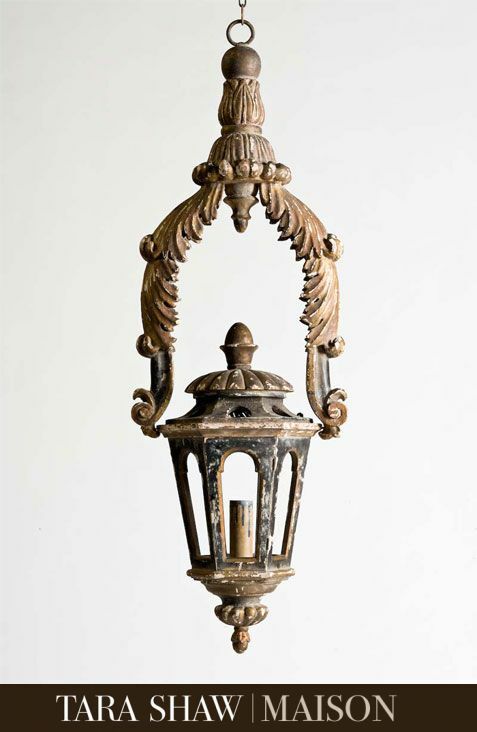 When it comes to choosing lighting for your home, think outside the big-box store and your house will have "jewelry" that you won't see in every one of your neighbors houses. Great post on lighting. Wow, I think Chandeliers are my favorite thing about design. 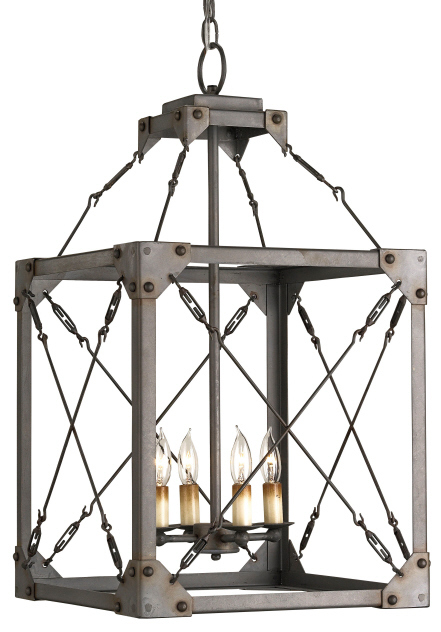 The industrial styled lantern is my favorite because it is so innovative. Thanks for blogging! Thanks Peggy and Terry! Thanks for reading! These are great examples of beautiful lighting. Agree with everything you say about dated fixtures and the ease of updating. Also, thanks for the guidelines re scale and installation. 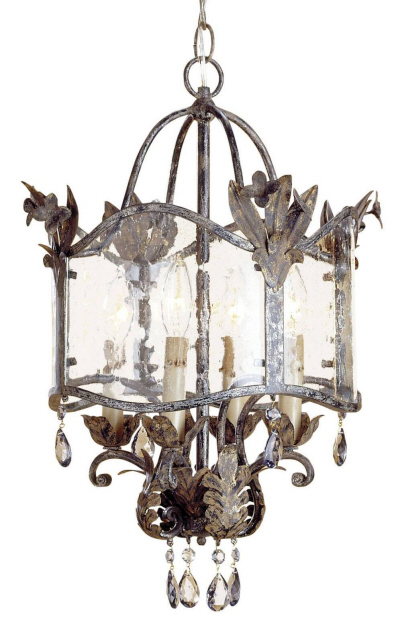 Do you have any recommendations for products to clean chandeliers with crystals?